Wilhelm Landig was the leader of a folkish movement in Vienna, Austria known as the Landig Group. He is a complicated figure, if not more so because of the things he has said concerning the German power structure during the Second World War and its aftermath. It is common of post-war folkish activists to denounce Hitler and Nazism, firstly because it prevents their activism from acceptance by the mainstream, and secondly because the nature of conspiracy theorists often tend to dismiss every organization other than their own as being antagonistic. The purpose of this article is to discern the probable truth concerning Landig, his statements and experiences that he has propagated. His Weltschauung falls in line with those who believe that Masons are the main perpetrators of the “global conspiracy” and have infiltrated everything. Only the SS, he believes, was not under their control. How the “Masons” controlling Germany through the 1930’s allowed the SS to rise independent of their control is an inconsistency that can’t be overlooked. Also, Landig has the frequent urge to call everyone a traitor but himself, which fits in line with the massive paranoia circling among the German troops at the end of World War II. It was believed that traitors and conspiracies were everywhere, Hitler himself recognizing and issuing several orders in response to the treason of various government officials. Those who were not around Hitler or who were not heads of state would have known even less and the truth that we get from them may have been exaggerated. For example, Landig calls Bormann a Soviet spy and that in the end Hitler was “surrounded by figures of high-finance and Masons”. Landig did not adjourn Hitler anywhere nor were they ever in proximity to each other, and we can only guess that he had this information from the rumors and words of his fellow SS. It was also known that Himmler was becoming increasingly distant from his loyalty to Hitler, as Skorzeny testified when he visited one of the internment camps. Neither Himmler nor the camp guards responded to his Hitler salute. It could be gathered that Himmler spread rumors about Hitler spread through the ranks of the SS, first through his immediate subordinates. At this point in the war, Himmler wanted most of all wanted to retain a cache of SS loyal to him even in the probable case of Hitler dismissing him from his position as head of the SS. In this case, it was most important to cause Hitler to look like someone who had betrayed the fatherland and no longer deserved the loyalty of the SS, or at least was under the control and manipulation of a foreign power such as Masons. He could not claim that Jews were manipulating him because Jews had been systematically rooted out of Germany and the German government with prejudice, while Masons could have gone into hiding easily more so. Masons could be ethnic Germans at the same time. Many of the German government figures were still Catholics, which further provided the possibility that they were Masons. Other inconsistencies reveal the rumor’s exaggeration and paranoia. For example, if it was known that multiple Masonic figures surrounded Hitler, why did no one take action, not even the SS like Landig or his superiors who could have easily drawn them up on false charges? The risk of death was not something feared by SS-men. The SS was also more powerful than any other public organization in Germany, and its independence - rather than subjecting it to the dictates of hidden organizations – gave it the ability to instead dispose of organizations within Germany as they pleased. Hitler was betrayed by many people when the Reich was falling and this was a generally known fact. Hitler called them traitors even when they hadn’t been disposed of their official positions yet, because he knew by their insubordination. Many of these people had been close to him. It could not be said, then, that Hitler was unaware of the forces which conspired against him. The documents and accounts left over from this time, from people who were there, prove this. Landig was on the front. Hitler was not under the influence of his cabinet because he, most of all, had the selective eye for betrayal at a moment’s notice. He had identified the traitors before anyone else had. He was ready to dispose of anyone who didn’t follow his will. The strictness kept around Hitler prevented anything from going on that wasn’t according to his orders. When this did happen, Hitler dismissed them indefinitely. He was sorrowed by the betrayals but took solace in those who remained under his command. A popular notion that Hitler was under the influence of drugs and his doctor has also surfaced after the war and was espoused by several Denazification groups operating by the Americans in Germany, and generally historians of a later era that sought to cash in on the Hitler-sensationalism with books like “The Goebbels Diaries”, which are known to be a fake. However this era of academia disregarded veracity in the name of sensationalism. We can therefore dismiss this claim among the many others that tried to play up the image of Hitler as a raving madman, when eyewitness accounts from the time never reported such a thing. The memoires of the people living in Hitler’s bunker are the most historically accurate to take from. The effect of this sensationalism from the 1960’s onward is evident in the fact that Hanna Reitsch testified against herself decades after the war with the claim that Hitler was withering away under drugs, while in the era directly after the war her account was much different and that rumor had not even begun to surface yet. Under this gigantic web of rumor and subterfuge, there is a truth to be discovered. The rumors of Hitler’s loss of control were most prominent among the SS stationed outside the fatherland and the groups under Himmler’s direct control. There is no doubt that conspiracy theorists who had long had their eyes on Masonic activity, and who believed that the entirety of the world was under the control of Masons, encouraged Landig after the war in these ideas. It fit the idea that Masons had orchestrated the war for high finance and had used Hitler, which is still a prominent view today. Landig no longer had to have reserves in claiming that the Reich’s government had been Masonic, and therefore subscribed to these theories in their full weight. This still totally disregards the Jews, which Landig partially blames but does not focus on because of the rumor about Hitler’s cabinet mentioned before. Another factor allowing Landig to propagate claims against Hitler was the fact that the surviving folkish movement did not require, and nor did it want, the worship of Hitler. Landig could view Hitler’s person as anathema and still propagate an ariosophical, “Aryan” world-view such as he did in the Landig Group and the ideology of the Black Sun. This effectively establishes a “new movement” without the full stigma of Nazism from the past. In one word, it was convenient. Other claims made by Landig are that the “last of the flying disks are rotting in the Andes, without the personnel or money to get materials to repair them”. One would think that if Landig believed in the fully-operational base of Point 103 in his first book, “full of facts” he hints, then they would be prepared with a plan in the long run to maintain their base. His books pander to a folkish crowd with various references and dealings of subject matter with the Externsteine for example and Base 211. It is suspected that Base 211 came late to his attention, only surfacing in his last novel in 1991 even though an Antarctic base to rival Point 103 seems too big of a fact to not mention for that long. Especially if an “accurate” picture of the world is attempted to be given from these novels. 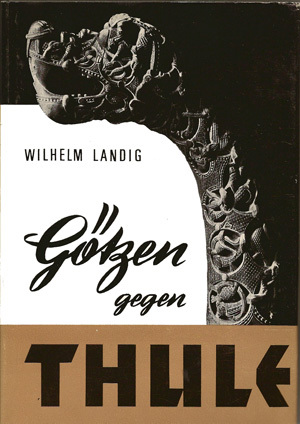 There have been claims that Landig was “given a mission by Himmler to revive the Aryan imagination after the defeat through symbolism”, therefore prompting the creation of the Landig Group and its literature. Subordination to Himmler and a personal mission given by him could have also been responsible for his anti-Hitler views, which nonetheless try to revive a Germanic, “Aryan” culture through literature. Himmler was known for his praise of the Bhagavad Gita and the Gitas of India, which Hitler was variously indifferent to over the works of his own Germanic countrymen, like the mythology of Wagner and Nietzsche. Landig also has a huge Vedic influence in name, which may have been part of the instructions from Himmler*. 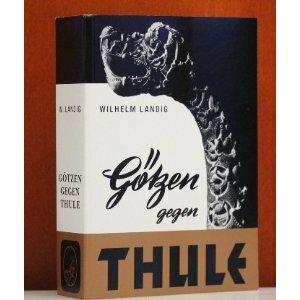 It could even be proposed that the world-view espoused in Goetzen gegen Thule and its sequels is actually the view of the world that Himmler wanted to survive had the war-effort failed, which invariably doubted and dethroned Hitler in favor of the heads of the SS. However Himmler did not want to heroify himself because of the suspicion that would have arose. Had Himmler survived, he believed he would have made his own name without the propaganda efforts he had instructed. How Landig would know that the German flying saucers were disposed of in the Andes is also inconsistent. After his “experience”, he had no connection to the Polar German bases or their personnel, as he himself stated. His role as a writer in the Landig Group no doubt takes part in this sensationalism, and while not being exactly counterproductive, it should not be taken at face value. The interview is very amateur because the questions it gives do not follow one another, rather they center around a very exposé-like format and center on topics sequentially that would be viewed as fantastic. 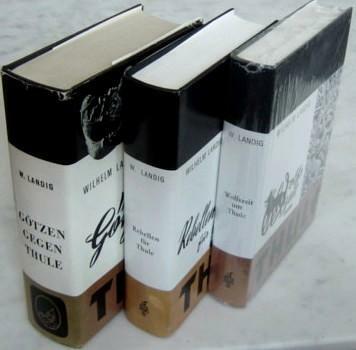 Another fact to remember is that Landig did not manage to write anything other than fiction. We could therefore view this sub-current of folkish ideology as “Himmlerian”, rather than “Hitlerian” National Socialism. Landig does not mention National Socialism and presents its party members as counterproductive or antagonistic, despite the fact that the entirety of the Germanic-folkish movement of the SS was founded by the NSDAP and Hitler. In a way it provides an ideology “free of Hitler”, as Himmler would have it. It is often said that the leaders in the NSDAP each had their own personal version of National Socialism, and this one may have been Himmler’s, distinctly different from Hitler’s. That is what accounts for the major differences in ideology that appear as idiosyncrasies in Landig’s works. *The ideology espoused by Himmler and Landig is strictly mythological rather than tantric, and therefore cannot be rooted in the Esoteric Hitlerism that Serrano learned from. The transcript can be viewed here.